Imagine being able to tackle Prince Edward Island’s streets in a stylish compact sedan that can save you money on fuel and present you with an enjoyable ride. At Charlottetown Toyota in Charlottetown, Prince Edward Island (PEI), we house a sizable array of Toyotas in stock for drivers to survey including the 2016 Toyota Corolla. Our dealership is one of Canada’s premier Toyota dealerships and has served Prince Edward Island for a number of years. Stop by Charlottetown Toyota at 1 Superior Crescent and discover a new Corolla today. As a compact vehicle, the new Corolla has a punchy motor that can save you money on fuel. The new Corolla comes with a 1.8-L four-cylinder engine that makes 132 hp. The Corolla’s engine can be paired to one of three transmissions that include: a 6-speed manual, 4-speed automatic and a CVT. When properly equipped, the Corolla can return 8.6L/100 km and 6.5L/100 km (city/hwy). Unlike other compact vehicles on the market today, the new Corolla comes with an extensive list of safety features. With the Corolla’s safety features, you can utilize the vehicle on a regular basis in confidence. The Corolla comes with a rearview camera, anti-lock brakes, brake-force distribution, traction control, vehicle stability control, brake assist and more. 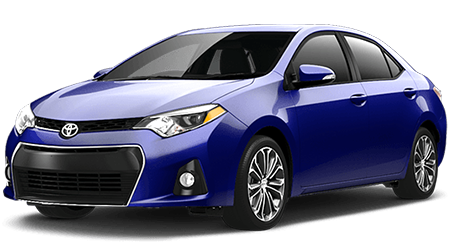 If you’ve been looking for a compact sedan that has all of the latest interior features and can save you money on fuel, then check out the 2016 Toyota Corolla. The new Corolla has an elegant design, is packed with a lengthy list of interior features and can save you money on fuel. At Charlottetown Toyota in Charlottetown, Prince Edward Island (PEI), you’ll get our best price on a vehicle and be able to test drive a large collection of Toyotas. Come by Charlottetown Toyota at 1 Superior Crescent and test drive a Corolla today.